Abraham Lincoln didn’t leave much written reflection on the profession that he pursued for almost twenty-five years, so these three pages of thoughts on the practice of law are particularly significant. 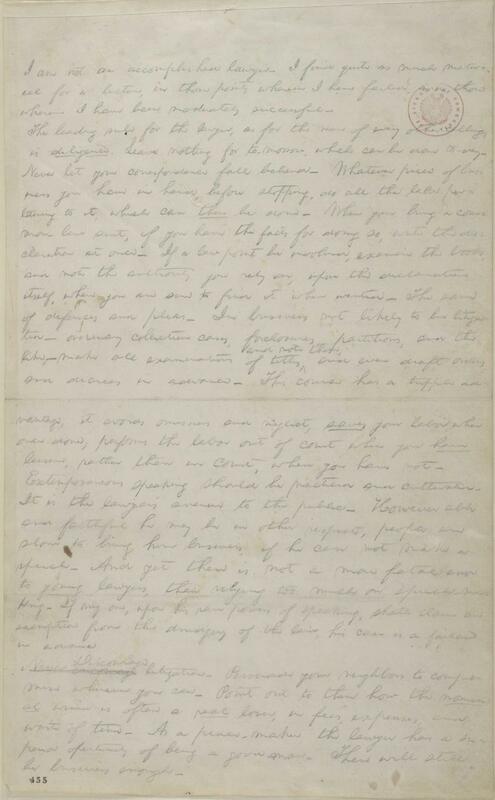 The provenance of this document is not entirely clear; historians speculate that these are notes Lincoln made in preparation for an 1850s-era lecture to a group of law students. The document is now held at the Library of Congress (you can read a transcript on their website). The document begins with characteristic modesty: “I am not an accomplished lawyer.” The future President proceeded to advise his audience on the need for diligence, encouraged them to practice a dedication to research and a way with words, and commented on the moral qualities necessary for good lawyering. Abe took lawyer jokes seriously. He wrote: “There is a vague popular belief that lawyers are necessarily dishonest.” Lincoln worried that young people who wanted to become lawyers would “yield to the popular belief” and indulge in shady dealings. The document, with commentary by former judge Frank Ceresi and Lincoln scholar Brian Dirck, is available via Kindle under the title Abraham Lincoln’s Law Notes. Thanks to Nell Minow and Frank Ceresi. The Abraham Lincoln Papers at the Library of Congress. Series 1. General Correspondence. 1833-1916. Abraham Lincoln, 1850-1860 (Notes for lecture on law).